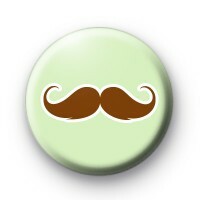 LIght Green and Brown Moustache badge with a lovely light green background and a curly waxed brown moustache illustration. Another one of our moustache badge range, this one is really popular for Movember. People use them for fundraising & are great to wear if you aren't personally growing a tache but are supporting someone who is. We have a massive range of moustache badges & all are made by hand in our family workshop. These are popular with stag parties, hipsters & barbers shops. Standard 25mm button badge.